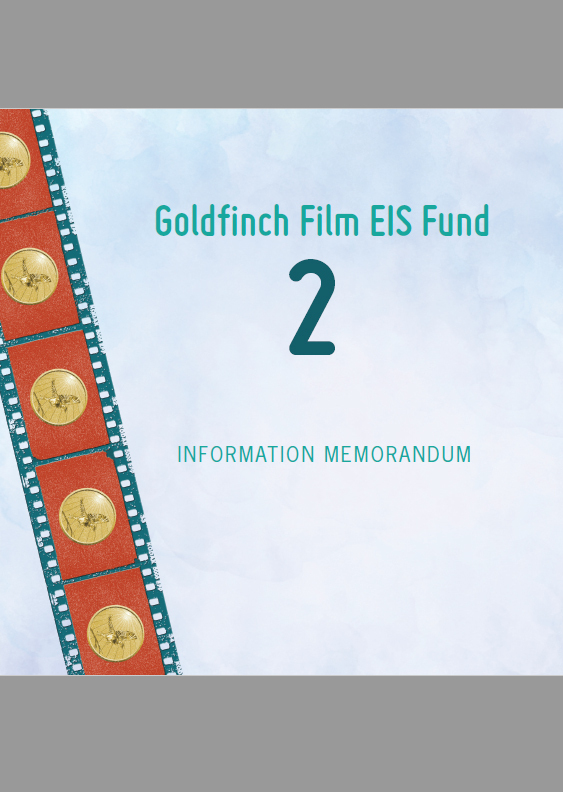 The Goldfinch Film EIS Fund 2 offers Investors access to investment opportunities in the UK’s growing film production industry by working with experienced professionals from the film, TV and radio sectors who are pooling their talents and opportunities. The Fund has been established to enable investors to invest in companies whose film and TV projects qualify for the UK’s Enterprise Investment Scheme. The Manager considers that companies in the film sector that are created and produced by experienced professionals and qualify for EIS tax reliefs have the potential to offer Investors an attractive return. Monies invested by the Fund into a Portfolio Company will be primarily used by these entities in pursuing their acquisition and investment strategy to develop support and integral services for those creating micro-budget films or new distribution channel either through traditional methods or new distribution channels. 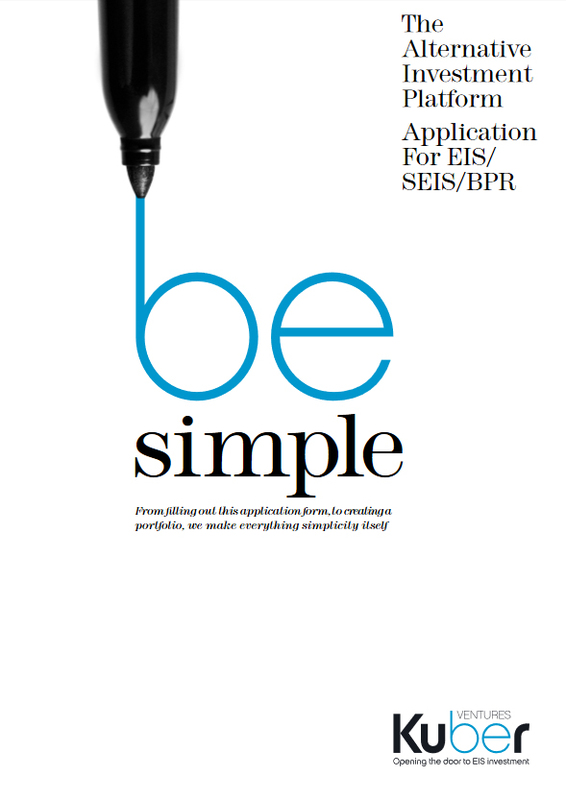 The Fund’s initial objective will be to invest in the first target opportunity, a qualifying EIS company outlined on page *; however, the Fund may invest in other Qualifying Companies to the extent that sufficient Subscriptions are received into the Fund to enable such investments to be made at the sole discretion of the Manager. The Fund will take a long-term view on the Portfolio Companies and will aim to only look at the possibility of facilitating an exit from an Investment after it has been held for a minimum of three years, thereby ensuring that the Investment has met one of the key qualifying conditions necessary for Investors to obtain the relevant tax reliefs. However, there may be occasions where an earlier sale is a commercially sensible decision. It is anticipated that most exits from Qualifying Investments in portfolio companies will take place after they have been held for four years though some could take longer depending on market condi7ons and the nature of the Portfolio Companies. The Fund anticipates that the following options may be available following a period of trade of at least three years, after which the Manager will consider full or partial exit options for shareholders. Amersham Investment Management Ltd (AMIM) FRN 507460 was established by Paul Barnes and Michael Waller-Bridge in 2009. 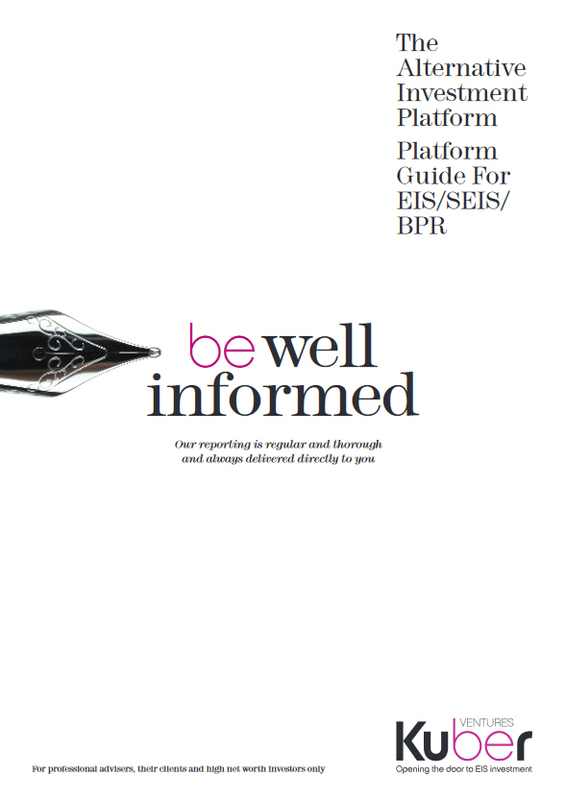 Regulated as an Investment Manager since 2012, AMIM provides professional and empathetic Investment Management to promoters and other regulated professionals, as well as the development and management of their own branded EIS & SEIS Funds. Goldfinch Entertainment Limited was founded in January 2014 with the backing of leading entertainment accountants Nyman Libson Paul. The Directors of Goldfinch Entertainment Limited (“GEL”) consider it to be at the forefront in providing entertainment and media advice. 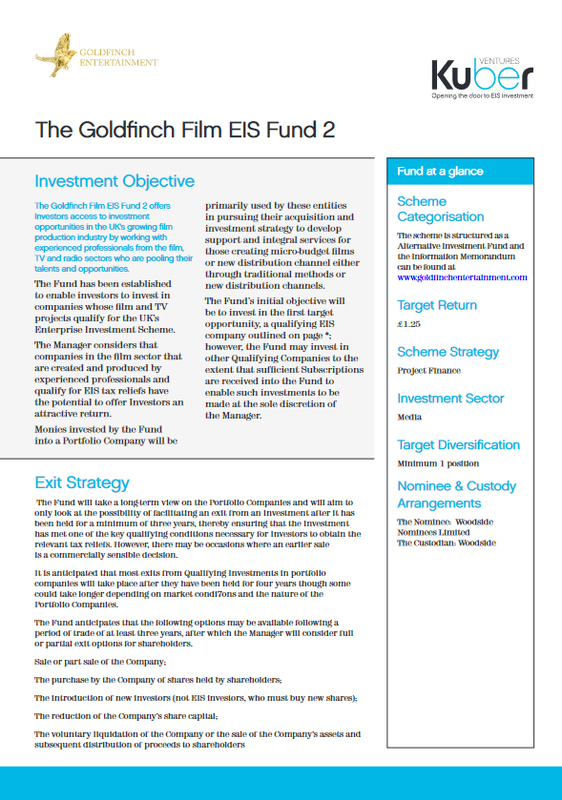 As a specialist company providing services to the film and media sector, Goldfinch Entertainment Limited, act as Executive Producers on all projects, structuring each in a bespoke manner and assisting with varying finance plans, including SEIS, EIS, GAP, private equity and offshore funding. To date the Goldfinch team has raised and deployed in excess of £22million for projects across the Film, TV, Animation, Video games and theatre sectors. The Goldfinch Entertainment team’s expertise has developed over recent years as they have introduced the Company’s specialist offerings. All fees paid by investee companies. The Manager will collect and administer a fee of 10% per cent on the total Subscriptions made by Investors to the Fund on a close/any subsequent close of the Fund. 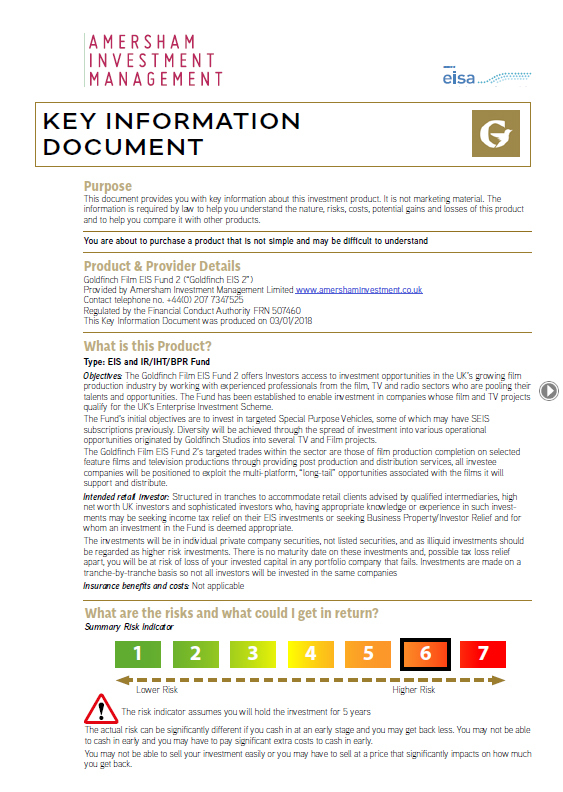 This Fee is payable to Goldfinch Entertainment Limited, the commercial advisor to the Fund. 0.75% per annum of the amount invested in each Portfolio Company, subject to a minimum fee of £3,500 per annum, payable by each Portfolio Company to the Manager. These fees are payable on an annual basis, payable quarterly in advance for five years thereafter, again paid quarterly in advance. The Portfolio Companies will also be charged an additional administrative fee of 0.65% per cent of the value of the Fund, for 3rd party costs and services incurred by the Fund Manager during the termination of the Fund. The Manager estimates the Portfolio Companies will incur an aggregate initial fee of £4,500 in respect of the Custodian’s role as Receiving Agent in relation to Investor Subscriptions and an aggregate first year fee of £5,000 also payable to the Custodian. Thereafter the annual fee to Portfolio Companies for nominee and custodian arrangements and services amounts to £100 per Investor plus VAT. To be agreed in advance, which may be payable by Portfolio Companies include Fund administration, due diligence, abort fees and reasonable fees incurred in managing the Fund. Goldfinch Entertainment will provide administrative services to the portfolio companies for an annual fee of £10,000 per annum of monies invested into each Portfolio Company from which they will discharge the costs of professionals appointed by portfolio companies, these fees will include audit and accountancy, legal and other professionals. Goldfinch Entertainment have agreed to provide office facilities for the Target Company at an inclusive annual cost of £5,000. Kuber receives a fundraising fee of 1% from the manager. Kuber will return this fee to Investors by applying it to their Subscription amount thereby increasing their investment.